Which Harry Potter Character Is Your Best Match? Welcome to my quiz! 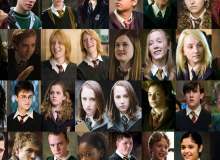 This will tell you who is your best Harry Potter character match! Could it be the charming Cedric? Or will it be bad boy Draco? Find out now! If you don't like your result, just retake the test! Heres a tip to get your favourite boy, choose the answer that suits them most! My personal favourite is either Draco Malfoy or Fred Weasley! If your boyfriend took you out, where would be the perfect date location? A cliffside watching the sunset, very romantic! An expensive dinner out, spending money. A gardening centre, studying plants. A nightclub, meeting new people! What would your boyfriend be like? Only includes you in things that concern you. Is very shy in conversations and you have to include him. Flirts with every girl that comes his way. Tries to protect you from any bullies. Plays silly little tricks on you and friends. Jokes around but includes you. Somewhere away from the professors and sniches. In detention, when the teacher isn't looking. In your secret pranking den. Just a glass of pumpkin juice. A huge plateful of random food. A bowl ful of sweets. When you finish Hogwarts,what do you and your boyfriend plan on doing? Explore all the dark secrets of Hogwarts! Settle down and start a family. Play more pranks and make mischief. He takes care of you but plays tricks. You and your boyfriend join the Quiddich team. Which role does he play? Anything that makes him win. Part of the crowd. He is too scared to play! CAPTAIN OF THE TEAM BOOIIIII!!!!!! Hes not that good but tries. He will protect you from any Blurdgers! Your boyfriend gets hit and injured badly from a spell. What do you do? The other girls will deal with it! Play a trick or two but then forget about it. A solid gold locket made especially for you! A box of delicious sweets. Aragog grabs you and ties you up, ready for his sons and daughter to have dinner. What does your boyfriend do? Casts a spell to make them go away. Gets his friends to untie you and kill the spiders. Finds a new girl to get with. Uses his inventions to get you out. Uses his beater bat to hit them away. Quiz topic: Which Harry Potter Character Is my Best Match?